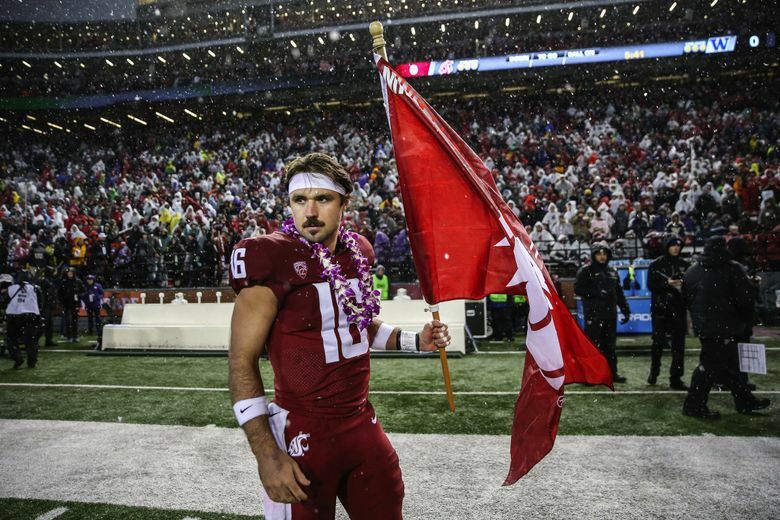 WSU's Gardner Minshew was voted the Pac-12's offensive player of the year, while UW's Ben Burr-Kirven was voted defensive player of the year by the Associated Press' panel of Pac-12 reporters. There’s no question at quarterback: Washington State’s Gardner Minshew II leads the way in the Pac-12. Unsurprisingly, he also got the nod as the league’s Offensive Player of the Year. Stanford’s K.J. Costello earned the second team quarterback honors. Minshew joins Arizona State running back Eno Benjamin as the two unanimous first-team selections on offense. There were several on the first-team defense: Washington’s Greg Gaines at defensive tackle, fellow Husky Ben Burr-Kirven at linebacker and Utah’s Bradlee Anae at defensive end. As for Pac-12 Coach of the Year, Washington State’s Mike Leach also topped all the ballots. Burr-Kirven was defensive player of the year and Minshew got the nod as newcomer of the year. Other Huskies named to the first team were center Nick Harris, cornerback Byron Murphy and safety Taylor Rapp. Named to the second team were running back Myles Gaskin and tackle Kaleb McGary. Another Cougar named to the first team was tackle Andre Dillard. Named to the second team were defensive end Logan Tago and safety Jalen Thompson. The 2018 Associated Press All-Pac-12 team, as selected by a panel of sports writers who regularly cover the league for newspapers or broadcast outlets. Players at all positions are listed alphabetically with name, school, height, weight, class and hometown; “u-” denotes unanimous selections. Quarterback — u-Gardner Minshew II, Washington State, 6-2, 220, sr., Brandon, Mississippi. Tackles — Andre Dillard, Washington State, 6-5, 310, sr., Woodinville, Washington; Calvin Throckmorton, Oregon, 6-5, 318, jr., Bellevue, Washington. Wide receiver — N’Keal Harry, Arizona State, 6-4, 213, jr., Chandler, Arizona; JJ Arcega-Whiteside, Stanford, 6-3, 225, sr., Inman, South Carolina. Running back — Myles Gaskin, Washington, 5-10, 193, sr., Lynnwood, Washington; Zack Moss, Utah, 5-10, 215, jr., Hialeah Gardens, Florida. Correction: A previous version of this story said Gardner Minshew is from Brandon, Missouri.